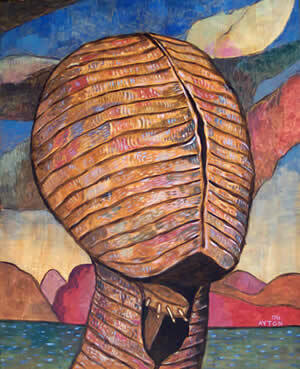 "Helm Head " 2004, acrylic on plywood, 24" x 19 3/4". 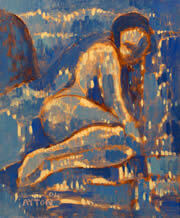 From a series of new color works that explore old themes, as well as new ones. The first 3 images below are from a new series of 10 "miniatures". 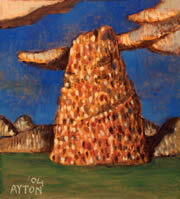 The works below comprise a series of mostly color paintings (and one drawing) done by William T. Ayton in 2004. Part of the impetus for creating this series was to render color versions of monochrome works done previously (some of which can be seen on other pages on this site), to see if a new dimension would be added to familiar images. There are also brand new pieces in this series not related to previous works. 2004 also saw two installations of The War Room, a series of murals and a stained glass panel for a synagogue chapel (to be photographed), as well as several other important works. 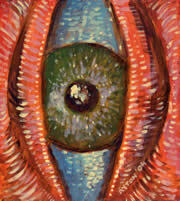 2004, 24" x 19 3/4"
2004, 14" x 10 1/2" approx. 2004, 19 3/4"" x 19 1/4"
2004, 19 3/4" x 18" approx. 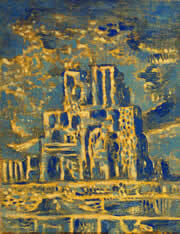 2004, 19 3/4" x 18"